If you've ever driven a car in SF, you know that trying to find parking can be what drives you over the edge, figuratively speaking (or literally, if you're too busy looking for that spot and didn't notice the Dead End sign -- ahhhhhhhhh!). What's worse, even if you do somehow find a spot, you need six rolls of quarters to park there for the next 4mins. 1. Offer a spot: If you have your own parking spot, you can 1) recoup some money by renting it out per-hour (you set the price and the hours it's available) and CARMAnation takes 15%, 2) rent out your spot and decide to donate proceeds to charity (awwww), or 3) you can list it for free because you are a saint. Literally, pretty sure the Pope is on board. 2. Book a spot: You search for a parking spot by address and can look within a five-mile, two-mile, one-mile, or four-block radius (basically, if you're bringing a bike, you'll have way more free parking options), and it'll furnish you with all the available parking spots in the area. The prices range from around $6 an-hour to free to 99-cents (someone has one right now in SOMA for $0.42 an hour), and all of them come with a full rundown of the spot -- i.e. is it in a private garage? What size car can fit in it? etc. Once you've found a spot, you book it for however long you want (/it's available), and BOOM (possibly) free parking. 3. 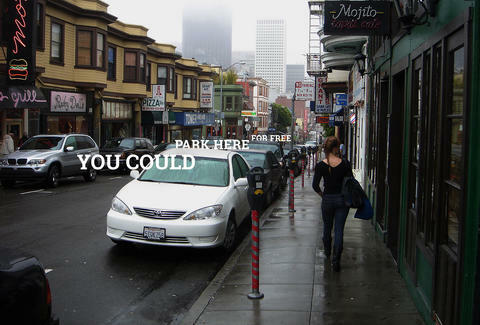 Swap a spot: And finally, if you have a spot in North Beach (HOW IS THIS POSSIBLE?!?!?) but you work in the FiDi where some other dude has a spot (HOW IS THIS POSSIBLE, TOO?!?!?) but he works in North Beach, the two of you can make like Eddie Murphy and Dan Aykroyd and trade spots. Joe Starkey is Thrillist's San Francisco Editor and refused to ever consider an apartment in North Beach after trying to look for parking there. Follow him on Twitter.